Water, Pea Protein Isolate, Expeller-Pressed Canola Oil, Refined Coconut Oil, Contains 2% or less of the following: Cellulose from Bamboo, Methylcellulose, Potato Starch, Natural Flavor, Maltodextrin, Yeast Extract, Salt, Sunflower Oil, Vegetable Glycerin, Dried Yeast, Gum Arabic, Citrus Extract (to protect quality), Ascorbic Acid (to maintain color), Beet Juice Extract (for color), Acetic Acid, Succinic Acid, Modified Food Starch, Annatto (for color). 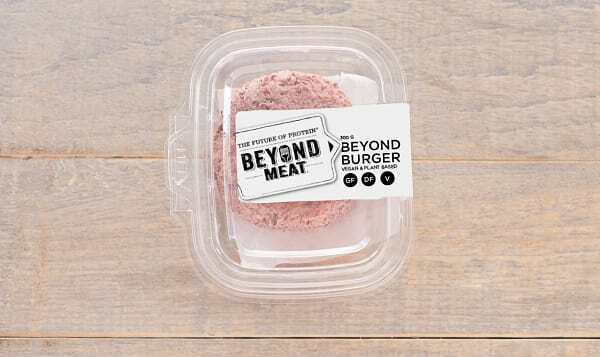 Beyond Meat burger patties are the world's first plant-based burger that look, cook, and taste like a fresh beef burger. It has all the juicy, meat deliciousness of a traditional burger, but comes with the upsides of a plant-based meal. The Beyond Meat burger patties pack 20 g of plant-based protein and has no GMOs, soy or gluten. Beyond Meat believes there is a better way to feed the planet. Their mission is to create mass-market solutions that perfectly replace animal protein with plant protein. They are dedicated to improving human health, positively impacting climate change, conserving natural resources and respecting animal welfare. At Beyond Meat, they want to make the world a better place and they're starting one delicious meal at a time.